I think it's finally safe to announce our happy news to the world: We're having another baby!!! I am 11 weeks pregnant and am due on October 21st. It hasn't been the easiest or happiest pregnancy thus far. It's been complicated, to say the least, very stressful and worrisome. On February 22nd (I will always remember the day!) I was at work when I started bleeding. A LOT!! My boss drove me to the ER, where my husband met me. After a million questions, some lab work, a physical exam and an ultrasound, I was told I had miscarried. If any of you have had the misfortune of experiencing a miscarriage, you definitely know the devastation and wide range of emotions I was feeling. It has to be one of the lowest points in my life. I mourned and grieved a child I had only knew existed for 2 short weeks. Then a week later I had a routine follow-up appointment with my OBGYN. To my shock and amazement, he found a heartbeat during an ultrasound!!! As soon as I saw that little black and white thing beating on the screen, I completely lost it. My husband hadn't come with me that day, so I was alone. I was a sobbing mess. I just kept thinking that my baby is alive!!! I barely heard a thing the doctor was explaining to me, but I have learned that a hematoma or a hemorrhage caused the bleeding. Weeks later is has decreased in size and is like a bruise or a scab. My doctor explained that when I deliver the afterbirth they will probably find this gross discolored thing that caused such a ruckus in my household. The ER team misdiagnosed me w/ a miscarriage because the dates of my last period would have put me at 6 weeks at the time of the bleeding. At 6 weeks there should be a heart beat. 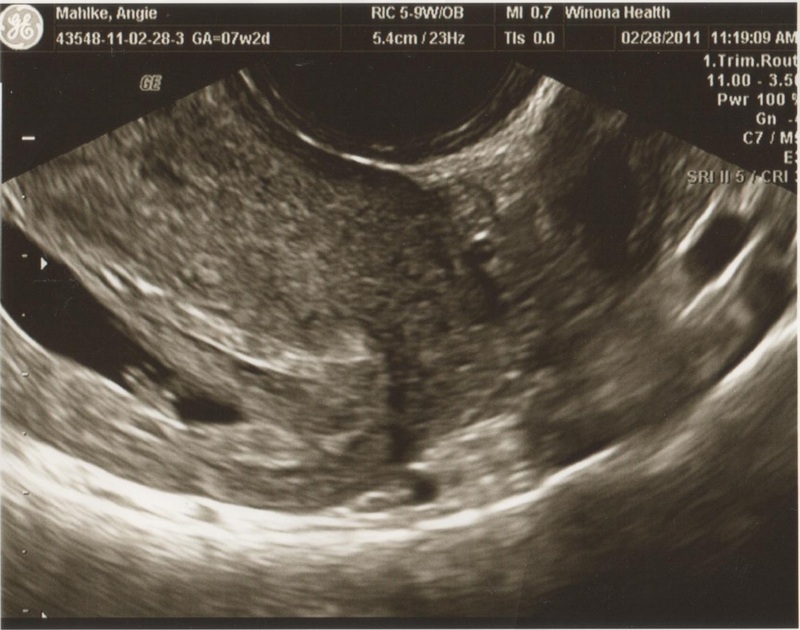 All they saw on the ultrasound was the yolk sak, but no fetus or heart beat. It has since been determined that at the time of the bleeding I was only 5 weeks along, so a heart beat would be hard to detect. Here is the ultrasound from the doctor appointment where I found out my baby is alive after all. 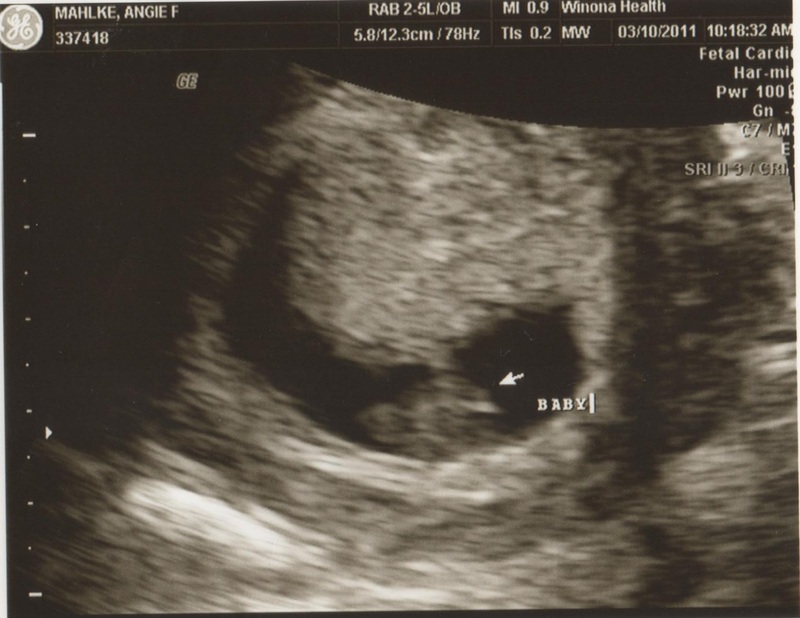 He/she is just this itty bitty blob with no defining features yet. Imagine that blob beating when you thought it had gone to heaven! I am 6 weeks pregnant here. My doctor then set up a radiology appointment for 10 days later. Those 10 days were the most stressful and nerve-wracking days I have experienced in my life. My doctor had given the pregnancy a 50/50% survival rate at that point. I was given strict instructions on what I could and couldn't do. I was paranoid about every little thing and so scared that I would lose the baby for real. I made my husband come with to the radiology appointment this time so he could ask a bunch of questions. Tears streamed down my face as I again saw my baby's heart beating. Here is the picture from that ultrasound. I am 8 weeks pregnant here. This ultrasound showed the hematoma had shrunk significantly, and they had declared the pregnancy normal and healthy. I could finally set up my prenatal appointments. It was weird meeting with the nurse in what should have been my first appointment for this pregnancy to go over our family medical history, but it was also very humbling because I knew it was a good step in the right direction. My baby is fine. Yesterday we met with my doctor for our first prenatal appointment. Dave and Spencer came, but Spencer did not like the doctor examining Mommy!! He cried and would not stop until finally Dave had to step out into the hall with him. The doctor could only faintly detect the heart beat with the doppler, so he did another ultrasound. 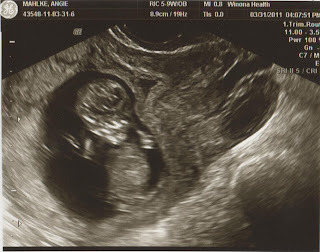 This marks ultrasound #4 for this pregnancy! The baby looks like a baby!! There's a head and some arms! I am 11 weeks here. As I lie on the table waiting for the doctor to find the heart beat, I got nervous and I kept silently praying, "Please let my baby be ok, please let my baby be ok." I guess it is hard to let go of the paranoia after thinking I'd lost the baby. It was so good to see the heart beating and watch the baby moving around on the screen. Dave and I kept pointing out the baby to Spencer, but he'd just point at the screen and shout, "baball!!!" He thinks everything on TV is basketball. After all of this, I feel like I can finally breathe a little easier and enjoy the pregnancy. Celebrate the new life Dave and I are bringing into our family. I'm scared still, I won't lie, but I think I'll continue to be a little scared until I can hold the baby in my arms. Life is so precious and so tenuous. I think I'm having a boy; Dave thinks the baby is a girl. Time will tell, time I'm grateful to have. Oh Angie and Dave, what wonderous news. I am so happy for you!! Wow! What an awesome miracle! God is so good! I am glad to hear everything is going well. I am so happy for you two and wish you all the best. I can't even imagine what you went through, I almost cried reading it! congratulations!! !